It would be unprecedented in the sense that it has never been done before, Arvind Manocha, chief operating officer of the venue, told PinoyWatchdog soon after presiding a press conference at the Rooftop Grill in Highland Blvd. 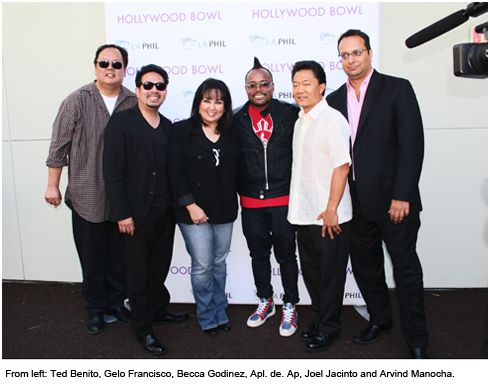 to announce the upcoming concert, Apl.de.ap Takes You to the Philippines: A Celebration of Global Filipino Music at the Hollywood Bowl. The June 14 gathering was attended by Black Eyed Peas rapper Apl.de.ap, Gelo Francisco of Philippine Chamber Singers, recording artist/songwriter Becca Godinez and Joel Jacinto of Kayamanan ng Lahi. Manocha recalled his excitement in collaborating with Apl. de. Ap, Ted Benito and others in putting things together. The idea had always been in his mind because some of his best friends were Filipinos while attending college at Cornell in New York. “And I thought of this because, you know, we have such a large community of Filipinos here in Los Angeles. Such a historic community. And the culture and music of the Filipinos are so robust, such diversity in the music and I thought this should be a wonderful way to get everyone to gather and celebrate.” The July 8 concert will feature pop and traditional Pinoy artists, hip hop, jazz, soul, R&B, OPM (Original Pilipino Music) and more, it was said. Apl. de. Ap was likewise palpable in his excitement. It would be another dream of his coming true, he said as he appeals for support for the event, for everyone to buy tickets and come early. He will be both curator and star performer of the show. In the latter, he will be joined by will.i.am and Taboo. Joel Jacinto, executive director of the service group Search to Involve Pilipino Americans (SIPA) and the spark behind the famous Kayamanan ng Lahi cultural dance ensemble, talked of his group’s participation which would include the evolution of our folk dance starting from its Spanish roots to the modern iterations. Gelo Francisco will be at his finest with the Philippine Chamber Singers especially with their rendition of the venerated Filipino love songs, the haranas. The Philippine-based Harana Kings (with Florante Aguilar) will also be performing, their first in the US. And of course there’s the multi-talented Becca Godinez who will be spotlighting once again the song that made Freddie Aguilar famous, Anak. Other notable artists lined up for Apl.de.ap Takes You to the Philippines: A Celebration of Global Filipino Music are Legaci, Martin Nievera, Jeremy Passion, Sandwich, Nicole Scherzinger, Culture Shock, Bucky Jonson, and Tateng Katindig and friends. Co-hosts will be Lou Diamond Philips, Vanessa Hudgens and Jo Koy.